This afternoon the senate killed the teacher merit pay plan, iSTARS, on a 16-19 vote. At Eye on Boise, Betsy Russell explains why Senator Tom Gannon, who had cast the deciding vote in favor of bringing the bill out of the Senate Education Committee,voted against it today. When SB 1436, the “iSTARS Lite” teacher pay legislation cleared the Senate Education Committee earlier this week, Sen. Tom Gannon, R-Buhl, cast the tie-breaking vote in favor of it. Gannon said then that the bill had been changed to address some of his earlier criticisms, and that Gov. Butch Otter’s decision to endorse the bill shortly before the committee vote helped sway him. Today, however, Gannon voted against the bill in the full Senate, where it failed, 16-19. “I wanted it to go to the floor. I thought the issue was definitely worthy of a full Senate debate,” Gannon explained afterward. In the end, Gannon said, “I never had enough confidence that the ISAT was an appropriate measure.” The bill based teacher merit bonuses on student scores on the ISAT test, which critics said during the Senate debate is a test that measures basics and lower-level thinking skills. Gannon said the ISAT is one measure, but others also should be taken into account before tying the measures to teacher pay. Gannon’s concern about the ISAT is right. The legislature ought to follow his logic and realize that the ISAT is not a valid or reliable measure for any of the various purposes for which it is currently being used. In fact, there is no single measure that is appropriate for high stakes decisions. The Senate Education Committee voted 5-4 to send Tom Luna’s ISTARS proposal for teacher pay to the full Senate with a “do pass” recommendation. * Voting in opposition-Sen.s Schroeder (R-Moscow), Bastian (R-Eagle), Burkett (D-Boise), and Sagness (D-Pocatello). Those who favored the proposal made the irrational argument that a flawed plan was better than no plan at all. Monday the IEA presented a proposal to the committee that teachers receive an across the board 3% increase paralleling what other state workers will receive and that a committee made up of representatives from the State Department, the IEA, the Idaho School Board Association, the Idaho School Administrators Association and the State Board meet and develop a workable incentive plan for teacher pay. We can hope the full Senate will see the wisdom of creating a thoughtful plan that brings to the table representatives of all parties who have a vested interest. 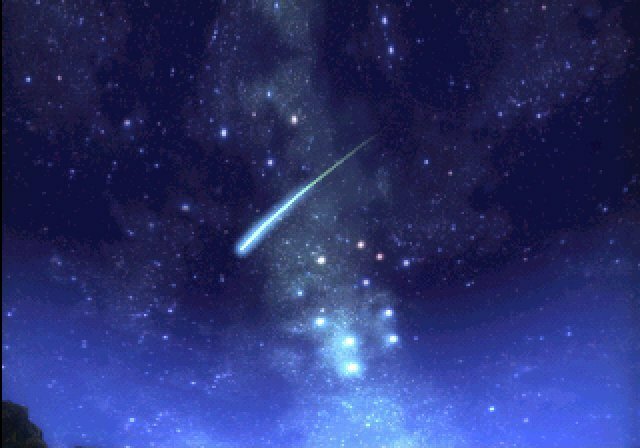 ISTARS will probably come up for a vote early next week, so if you agree that ISTARS is flawed and the IEA’s proposal ought to be considered, send an e-mail to your senator letting her/him know your thoughts. You can find Senator’s contact information here. John McCain has a Bush problem. Today he received the endorsement of 41 and over the weekend 43 verified that he is a real conservative. Nevertheless, “Bush Linkage” carries with it a problem. According to New York Times reporter, Elizabeth Bumiller. Actually, this points out that McCain has two problems. On one hand, he has to distance himself from the most unpopular President in recent history if he hopes to win the support of anyone other than the most rabid right wing Republicans. In fact, it is likely that the Democrats will do everything they can to connect McCain with the failed Bush policies. Having Bush campaign with McCain will just play into that strategy. McCain’s other problem is raising enough money to wage an effective campaign and, in many cases, it is those rabid right wingers who have the deep pockets he will need to support him. Expect to hear about Bush speaking at more $1000 a plate invitation only “dinners” in front of the ever loyal “Rangers” and “Pioneers” still to be found in the remaining pockets of Red America. Unfortunately, that is likely to include Idaho, according to Bumiller. So look for Mr. Bush to make solo appearances on behalf of Mr. McCain before evangelicals and in Republican pockets across the country, and to campaign in places where there are important races for the House and Senate, like Idaho and Kansas, which will not be critical destinations for the Republican nominee. Frank Rich has an excellent column in the Sunday edition of the New York Times. Rich points out the critical problem for the Republican Party in the upcoming election. They represent the past. 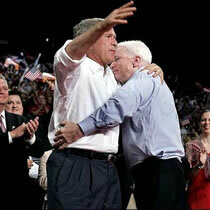 The difference between the two parties is most clear when McCain’s campaign is contrasted with Obama’s. it was a rerun of what happened to Hillary Clinton the night she lost Iowa. 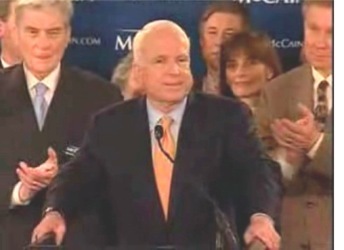 Senator McCain, backed by a collection of sallow-faced old Beltway pols, played the past to Mr. Obama’s here and now. Mr. McCain looked like a loser even though he, unlike Senator Clinton, had actually won. For Mr. McCain, this albatross may be harder to shake than George W. Bush and Iraq, particularly in a faceoff with Mr. Obama. When Mr. McCain jokingly invoked the Obama slogan “I am fired up and ready to go” in his speech Tuesday night, it was as cringe-inducing as the white covers of R & B songs in the 1950s – or Mitt Romney’s stab at communing with his inner hip-hop on Martin Luther King’s birthday. Trapped in an archaic black-and-white newsreel, the G.O.P. looks more like a nostalgic relic than a national political party in contemporary America. A cultural sea change has passed it by. Rich uses a particularly apt story from his home state of Virginia as one example of this sea change. I almost had to pinch myself when Mr. Obama took 52 percent of Virginia’s white vote last week. The Old Dominion continues to astonish those who remember it when. Here’s one of my memories. In 1970, Linwood Holton, the state’s first Republican governor since Reconstruction and a Richard Nixon supporter, responded to court-ordered busing by voluntarily placing his own children in largely black Richmond public schools. For this symbolic gesture, he was marginalized by his own party, which was hellbent on pursuing the emergent Strom Thurmond-patented Southern strategy of exploiting white racism for political gain. After Mr. Holton, Virginia restored to office the previous governor, Mills Godwin, a champion of the state’s “massive resistance” to desegregation. Today Anne Holton, the young daughter sent by her father to a black school in Richmond, is the first lady of Virginia, the wife of the Democratic governor, Tim Kaine. Mr. Kaine’s early endorsement of Mr. Obama was a potent factor in his remarkable 28-point landslide on Tuesday. I see this in the college students I teach. Ten years ago my students were apathetic. Politics only engaged a few. Today, they are activists. In most cases, it is Obama who inspires them. If, as Morley Winograd and Michael D. Hais claim, they are part of a “Millennial Generation”, it is easy to see why. This Millennial generation (born between 1982 and 2003) is the largest in American history, even larger than the baby boomers, and roughly 40 percent of it is African-American, Latino, Asian or racially mixed. They see McCain as a tired old white man peddling tired old ideas. Hardly good news for the straight talking maverick. As near as I can tell the only insight Rush Limbaugh has ever had concerning human behavior is when he dubbed his listeners “ditto-heads.” Those on the right who are only comfortable (safe) when “father” does the thinking for them are in a bit of a quandary when they are in the communication business. Right wing bloggers and journalists, unable to conjure up an original thought, frantically search the web hoping to find some fresh “spin” that they can re-cycle as their own. As I anticipated last week, Jack Tapper’s “Obama Cult” storyline has been cycled and recycled throughout the wingnut blogopshere. As the photo above indicates, it has finally rippled out to the absolute shallow end of the pool, Ralph Smeed’s Farm City billboard. But no, Ralph, ditto-head that he is, had to join the “Obama Cult” krew. Most Canyon County residents know about Smeed, Farm City and the infamous billboard. Smeed, the Libertarian emperor of Farm City, uses the billboard to take out his frustrations as he becomes increasingly irrelivant. In his hayday, the early 70’s, Smeed was the mentor to the neophyte politician and current Idaho Governor Clem “Butch” Otter and to former Idaho Senator Steve “take a bite out of government” Symms. In those days Smeed gave both advice and campaign dollars to Otter and Symms. Not at all, as can be seen here, Ralph has one of those newfangled blog things. Of course, the blog only has one post and that is an article he wrote in 1994 predicting how the world as we know it would collapse if the new trend of banning smoking in the workplace spread from San Francisco to Idaho. Traditionally, a Hobson’s choice is a free choice in which only one option is offered, and one may refuse to take that option. The choice is therefore between taking the option or not taking it. The phrase is said to originate from Thomas Hobson (1544-1630), a livery stable owner at Cambridge, England who, in order to rotate the use of his horses, offered customers the choice of either taking the horse in the stall nearest the door-or taking none at all. It is analagous to the expression “my way or the highway”. Conservative Republicans seem to find themselves in just such a position. It appears that John McCain is “the horse in the stall nearest the door” and many conservatives are not taking it. How else do you explain Huckabee winning in Kansas and Louisiana and running very close in Washington? How do you explain Romney winning the straw poll at the CPAC convention after he had already “suspended” his campaign? How do you explain the positions of Rush, Hannity and Ingram spewing anti-McCain rhetoric into the empty minds of the Stepford clones who tune in daily so they will know what to believe? Finally, how do you explain this from the WSJ? Mike Huckabee this week picked up the endorsement of Focus on the Family founder James Dobson, who reiterated his statement Tuesday that he could not vote for presumptive Republican Presidential nominee John McCain even in November against a Democrat. Speaking of Senator McCain, the Christian broadcaster said “His record on the institution of the family and other conservative issues makes his candidacy a matter of conscience and concern for me. Dobson’s choice is a Hobson’s choice for socially conservative Republicans. Some, like Dobson, may choose to stay home rather than vote for McCain. Many will end up voting for McCain, but with no enthusiasm. McCain has an uphill battle beating either Clinton or Obama under the best of circumstances but, without a fired-up Republican organization, his chances appear to be pretty slim. Here in Idaho, Republican party leaders who endorsed Romney (i.e.Risch, Simpson and Luna) will probably pinch their noses and support McCain. 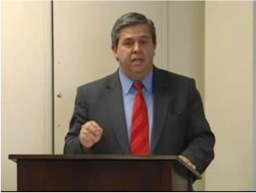 Whether the more rabid social conservatives like Bryan Fisher will come around is doubtful. Over at the Statesman, Kevin Richert explores this issue in some depth. He thinks that the possibility of Idaho Republicans abandoning McCain and voting for a Democrat depends on who the candidate is on the Democratic side. If the Democrat is Hillary Clinton he thinks Idaho Republicans will either grudgingly vote for McCain or stay home. If the candidate is Obama, Richert thinks moderate Republicans and Independents are likely to vote Democratic. Of course, at this point, all is speculation. Still, it is fun to watch if you are a Democrat. One of the more interesting national exit poll results I read this week stated that 84% of Democrats will vote for the Democratic candidate regardless of whether it is Obama or Clinton. Who would have imagined a divided Republican party and a unified Democratic party. I guess Democrats owe a big thanks to Bush- the great unifier! Obama a Mac and Clinton a PC? An article in the New York Times asks that question. As an Obama supporter and a Mac user, the headline caught my eye. I was a bit disappointed because Noam Cohen, the author of the article, limited his comparison to the web sites of the two candidates. Mr. Obama’s site is more harmonious, with plenty of white space and a soft blue palette. Its task bar is reminiscent of the one used at Apple’s iTunes site. It signals in myriad ways that it was designed with a younger, more tech-savvy audience in mind – using branding techniques similar to the ones that have made the iPod so popular. Mrs. Clinton’s site uses a more traditional color scheme of dark blue, has sharper lines dividing content and employs cookie-cutter icons next to its buttons for volunteering, and the like. I started thinking about Super Tuesday and my experience at the Canyon County caucus. Four years ago the caucus was held in the Hispanic Center and the 220 attendees were generally quiet and (PC) businesslike. I would guess the average age to be 40-50. This Tuesday’s crowd was not only larger (1,636), but different in a number of important ways. It was certainly much more ethnically diverse. Those who claim Obama doesn’t appeal to Hispanic voters didn’t see the group in the Nampa Civic Center. I am not sure what the average was, but the age range was amazing. It was wonderful to watch seniors and young, first time voters, demonstrate what participatory democracy looks like. I talked to Araceli Gomez, a young history teacher from Wilder High School. She had conducted a mock caucus at her school during the day and brought a school bus full of her students to participate in the real thing. My wife and I stood in line behind three high school students. The Hispanic boy was showing his iPhone to the two girls, one Hispanic and the other Anglo. They played with the touch screen, looked at “My Space” and called mutual friends to tell them where they were and what they were doing. While I stood in line with nothing to do, they laughed and chatted and made the waiting rather festive. So, I guess it makes sense to say that Barack Obama attracts a “younger more tech-savy audience.” The question is, why? I think it is deeper than superficial appearance. If the “Obama is a Mac” analogy follows, then we might be wise to consider some of the lessons we can learn from the success of Apple. Every time Apple released a new product conventional wisdom claimed the initial success was a fad and would soon fade. Sure it looked cool, but it was all about appearance. What conventional wisdom failed to understand was that Apple’s success is not just about “branding.” With Apple, form follows function. The loyal Apple users (some call them a cult) understand that Apple products work. Sure, Apple products appeal to tech-savy young people who want to be on the cutting edge of technological change, but they also appeal to those like my 92 year-old mother who uses a Mac because it is so user-friendly. Not only do Apple products work, but customer service is the best in the industry. An Apple store is a joy to visit and the Apple website is intuitive and easy to use. Cool has a way of coming and going, of shifting form more rapidly than the Idaho political terrain is given to change. Sen. Barack Obama, the runaway winner in Idaho’s caucuses, cashed in on the commodity of cool. I don’t believe that the majority of Obama supporters showed up at the caucuses simply because it was the “cool” thing to do. The Obama supporters I talked to are less interested in superficial appearances than they are in the deeper issues Obama addresses. While the pundits are still viewing him through the lens of identity politics, Obama supporters (particularly the young ones) seem to view that as a non-issue. The fact that he is an African American man is less important than the message of change, unity and hope that resonates deeply with them. My greatest fear is that the final delegate count is so close Clinton gets the nomination based upon the votes of the Super Delegates (who represent the old guard DNC loyalists) at the national convention. If that happens, I can see the young Obama supporters like the ones at the caucuses becoming disillusioned and the party losing a tremendous opportunity to revitalize its core. 1) If Hillary is a PC and Barack a Mac, what is McCain? Maybe, an IBM running Windows 98? 2) An Apple iPhone is cool, not is a faddish sense, but in a Marshall McLuhan sense. UPDATE– I should have anticipated this– There appears to be another way in which Mac fans and Obama supporters are similar– THERE ARE BOTH FOLLOWING A CULT! The PC establishment just doesn’t get it. Jack Tapper, the clueless “ABC News Senior Correspondent” here, Kathleen Geier at Talking Points Memo and Time Magazine‘s Joe “even more clueless than Tapper” Klein are all worried about this. Excuse me, but this sounds more like a cult than a political campaign. And yet there was something just a wee bit creepy about the mass messianism – “We are the ones we’ve been waiting for” – of the Super Tuesday speech and the recent turn of the Obama campaign. “This time can be different because this campaign for the presidency of the United States of America is different. It’s different not because of me. It’s different because of you.” That is not just maddeningly vague but also disingenuous: the campaign is entirely about Obama and his ability to inspire. Rather than focusing on any specific issue or cause – other than an amorphous desire for change – the message is becoming dangerously self-referential. The Obama campaign all too often is about how wonderful the Obama campaign is. The Kennedy presidency was the last time young people were inspired to public service. I wonder if the prospect of that happening again is what is really worrying the PC political establishment? In any event, I imagine we have just heard the opening salvos of the “Obama Cult” story line. The not-too-subtle attempts to compare Obama with Manson (their Helter-Skelter cultish qualities) or Jim Jones (are Obama supporters drinking kool-aide?) are just beginning. And, unfortunately, the story line is likely to echo Klein’s dishonest claim that Obama message is all about change without “focusing on any specific issue or cause.” I might believe that charge if I hadn’t watched the debates or if I hadn’t been in Taco Bell Arena Saturday. It was a raucous caucus in Canyon County tonight. Many of the Obama supporters who braved the long lines in frigid weather to hear him speak at Taco Bell Arena on Saturday found themselves repeating the experience at the Nampa Civic Center. On both occasions, the wait was worth it. Inside the crowd was in a festive mood and the results were never in doubt. The first count resulted in Obama with 72%, Clinton 20%, Uncommitted 7% and Edwards 1%. After it was determined that the Uncommitted and Edwards supporters didn’t have the necessary votes to receive a single delegate, the second vote resulted in 23 delegates for Obama and 6 for Clinton. With just over 79% of the count, Obama’s Canyon County vote was close to the overall Idaho results of 81%. All in all, a pretty amazing night for Idaho Democrats. Here are some pictures from Nampa Civic Center. The Huffington Post has provided an addictive service on their website. It is a Google Map that allows you to search by Address, Zip Code, City, Name, Occupation and Employer to find out how much individuals have given to the various candidates for President. Of course, you can see what your favorite celebrity gave, but it is also interesting to use the data base to explore city-by-city. A search for Boise reveals that of the $195,955 donated by Boise residents, $148,665 was given to Republican candidates and only $47,290 to Democrats. This is not surprising, but it should act as a reality check to Democrats who were so elated by the turnout for Barack Obama. As would be expected, the majority of the Republican money has gone to Romney, although a number of Boise power brokers (Steve Appleton, John Fery, Roy Eiguren) were Giuliani supporters. Democrats were fairly evenly divided among the 2007 field. Because this data is not current (the most recent is 4th quarter 2007) and many of the candidates have subsequently dropped out, there aren’t too many conclusions to be drawn— except that, when it comes to fundraising, Idaho is still very Red and Democrats have a lot of work to do.